This morning I read a story on BigGovernment.com regarding a meeting for David Dewhurst held at an Obama friend’s house. This story alleged that David Dewhurst had a fundraiser at the house and got cash from these Liberals. Below are excerpts from the new Story and the Previous Story. What do you think? First, there were no funds solicited or raised during Lt. Gov. Dewhurst’s trip to Washington Nov. 20-22. He was invited to use the Podesta townhouse not by Tony Podesta, but by Republicans who work for the Podesta Group. All 17 names on the invitation (attached) to this meet-and-greet have Republican backgrounds, and there were no Democrats. The Podestas did not attend the event, nor did either donate any money to Dewhurst, nor do we expect them to do so at any future time. Chalk another one up to “bipartisanship.” David Dewhurst, the lieutenant governor of Texas, spent time in November hanging out with his left-wing friends in Washington D.C. to raise a little scratch for his run for the Senate. One of those friends was Tony Podesta, a major fundraiser for the Democratic Party, who held a fundraiser at his townhouse for Dewhurst. The hosts of the party were all typically fundraisers for Democrats. Podesta himself heads up the Podesta Group, which earned a whopping $27.4 million in lobbying fees last year. Salon.com, no right-wing outlet, labeled the Podesta Group a firm with “close ties to the Democratic Party and the Obama administration.” Tony and his brother John are frequent visitors to the White House. Podesta has worked for political campaigns for Bill Clinton, Ted Kennedy, George McGovern, and Michael Dukakis. He was a founding member of the radical liberal group People for the American Way. 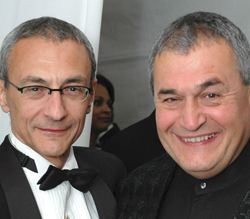 Tony Podesta’s brother, John, actually co-founded the Podesta Group and acted as Chief of Staff for Bill Clinton, as well as helping form up the core of the Obama Administration. John now runs the Center for American Progress, a group closely linked with Obama. The last few politicians for whom Podesta had fundraised: Steven Horsford (D-NV); Sanford Bishop (D-GA); Peter Visclosky (D-IN); G.K. Butterfield (D-NC); Patrick Murphy (D-PA); Allen Boyd (D-FL) … and the list goes on. He does fundraise for Republicans from time to time, but only ones with deep ties to the oil lobby, like John Barasso (R-WY). So what was Dewhurst doing with all these Democratic bigwigs?